Yesss! Today is the first day of school holiday, what is your plan? Anyone going for holidays, balik kampung, family trip to the theme parks, outdoor activities or your family prefer indoor activities such as hang out at the shopping mall watching movies, play games and shopping. I am sure we all feel the pain with the rising cost of living and the newly added GST tax. We want to stretch our ringgit and save more, right? Great! Now we can shop smart and save with CARDPOW! this school holiday at the theme parks and shopping malls. Psst… here are the popular discounts at CARDPOW! 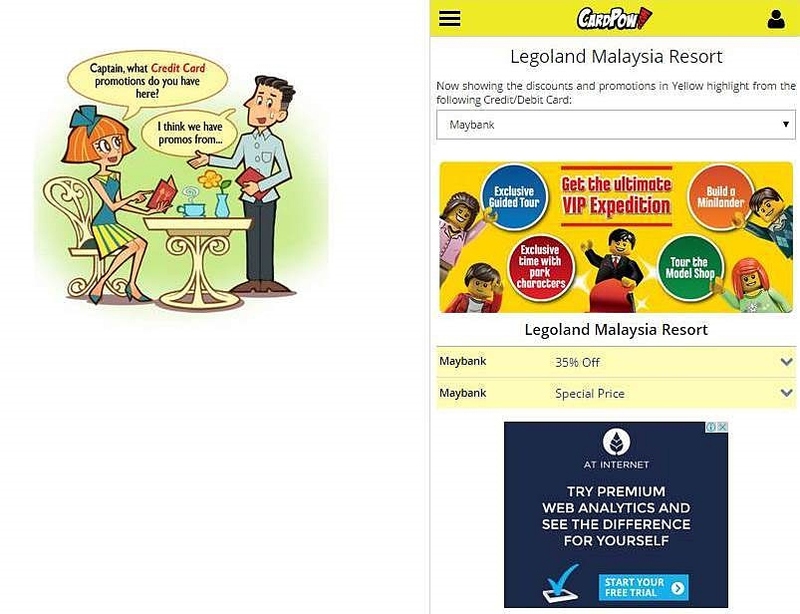 Angry Bird Activity Park in Johor Bahru up to 25% discount; Discoveria interactive exhibition at Avenue K 20% discount; Papa Johns 30% discount; Legoland Malaysia Resort at 35% discount; Berjaya Times Square Theme Park at 15% discount; Borders Bookstore 10% off; Genting Theme Park get free gift and XPLORASI-Petrosains Gift Shop 15% discount. 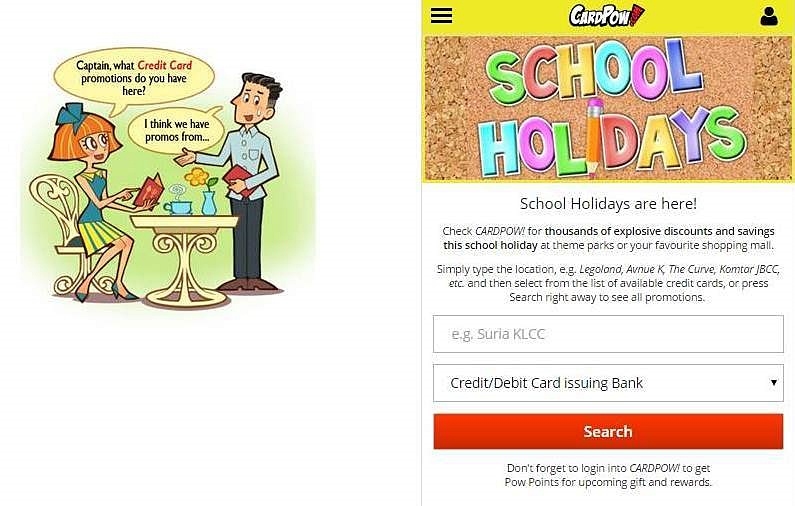 Besides all these, there are many more discounts, savings and free gift that you and get by using your credit/debit cards all you need is go and check out at CARDPOW! before you make your purchase. 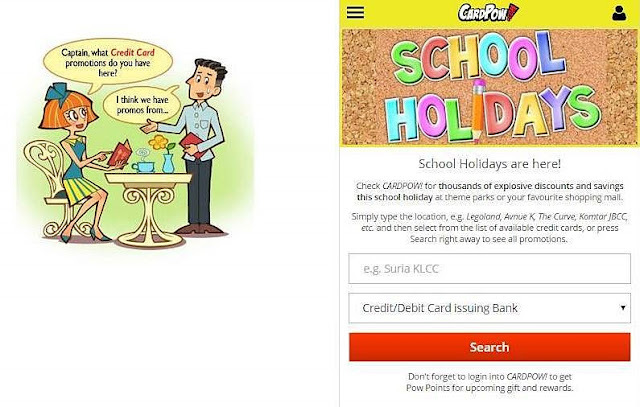 Well, most Malaysians carry 2 credit/debit cards on average. However most of us don’t even know what the discounts available for our credit/debit cards as banks have stop printing the discount booklets, leaflets and some don’t update their website regularly. I often miss out and feel frustrated when I know it too late because the cashier already swiped my card… arghhh! I need a website that I can just key in the restaurant, shop, salon or outlet that I wanted to go and check what are their discounts using the various credit/debit cards that I have. Bingo! Now we have CARDPOW! it is a website that let us find discounts for our credit cards. So CARDPOW! has compiled all the discounts for us to search and compare in one easy to use website. Now you can shop smart and save with CARDPOW! CARDPOW! want to make our shopping experience much more exciting by having all the credit/debit card discounts and promotions to compare in one website! It can be accessed anywhere using your browser on iPhone, Android, Nokia or Blackberry. You don’t need to download any app, all you need to visit the website HERE. 1. Type in the desired location and press search to see all the promotions and discount available. For example, before I make my trip to Legoland and wanted to know and plan my trip. All I need to do is go to the website and type in the location, there is an option to narrow down the search by choosing the credit card that I have only or I can just key in the locations and press search then all the discounts available for all the credit cards will appear. It’s an easy, simple and straight forward website. I can use CARDPOW! to compare the various discounts and promotions offered by the credit/debit cards. 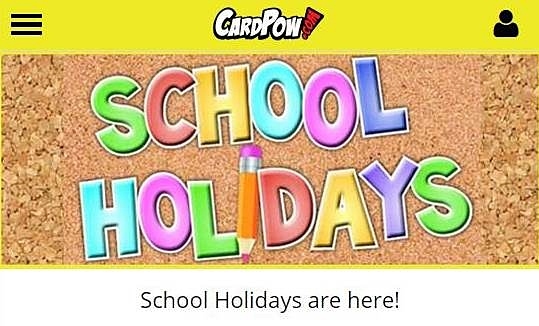 Plus, be rewarded with Pow Points when I use CARDPOW and play games to earn plenty of exciting rewards.